JJC LH-XF1855 Lens hood is designed for Fujifilm Fujinon XF14mm F2.8 R and XF18-55mm F2.8-4 R LM OIS. Lens hoods are primarily designed to prevent unwanted stray light from entering the lens by extending and shading the end of the lens. 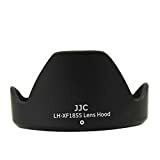 JJC LH-XF1855 Lens hood features a non-glare matte finish on the interior surface to further prevent or limit lens flare. In addition, since the end of the lens is extended, you also get the added benefit of some extra protection from accidental impact. This flower shape lens hood also takes the final image’s shape and aspect ratio into account. It allows the lens hood to block stray light with the higher portions of the lens hood, while allowing more light into the corners of the image through the lowered portions of the hood. This hood is also reversible to stay on lens when not in use. Now the original Fujifilm lens cap can be attached to the lens normally. This entry was posted in Discount Photography and tagged Fujifilm, Hood, lens, LHXF1855, Series by Ball Photo. Bookmark the permalink.